Cleanstart is a multipurpose but mainly business oriented Wordpress Theme, built to serve as a foundation for your web projects. The Design is based on fine typography and large photography with post-flat UI approach that will add uniqueness to your project. It is based on Twitter Bootstrap (check out BS excellent documentation), the front-end development framework with a steep learning curve that changes the way you develop sites. Cleanstart lets you build your pages and posts with a Visual Builder and a great collection of Custom Shortcodes that offers flexibility and pixel-perfect design. WordPress is well-known for the easy installation. Under most circumstances installing WordPress is a very simple process and takes less than five minutes to be completed. Many web hosts now are offering tools (e.g. Bluehost, mediatemple) for automatic installation. However, if you wish to install WordPress by yourself, read about the Famous 5 Minutes Installation. Now what? Follow the next steps to install Cleanstart as a WordPress Theme. After CleanStart is installed, locate it and click Activate. If you consider installing the child theme ( which is strongly recommended ), then there is no need to activate the parent theme in this step. * Note You should not upload the whole item you have downloaded from Themeforest because you will get an error of broken stylesheet file. Instead locate the CleanStart.zip file inside the main file you downloaded. Warning: while installing your theme through WordPress admin, you may encounter an error message saying : “are you sure that you want to do this?”. This is mainly due to your hosting php settings. CleanStart theme zip file is roughly around 6MB and in some hosting configurations the default limit for max upload is 2MB. To solve this problem you should either increase your maximum upload limit (at least to 8MB) on your hosting admin panel, or ask your host to do it for you. This is a common request and they should be able to assist you. Cleanstart comes with a child theme included in the theme package. Installing a Child Theme is almost the same as installing any other WordPress theme. The only difference is that you need both the parent theme, and the child theme uploaded to your WordPress theme directory. So, follow the steps described above once more, but now upload cleanstart_child.zip instead. We focus on using the latest web standards and practices regarding WordPress theme development. We strongly recommend our customers to install the child theme in order to ensure hassle-free updates. Read all about Child Themes! When the theme is uploaded, you have to activate it. Go to Appearance > Themes and activate Cleanstart theme. If you consider installing the child theme ( which is strongly recommended ), then repeat the FTP procedure for cleanstart-child.zip file and activate this instead. This is Plethora's theme framework plugin. Please make sure that it is always installed & activated, otherwise your theme will not be functional. Visual Composer allows you to edit your content using an enhanced page builder. You are expected to use the version included in the package, as it is configured to work seamlessly with the theme. Please, note that we do not offer compliance with any licensed version of Visual Composer plugin other than the one included in Cleanstart's Package. Contact Form 7 ( recommended ). Contact Form 7 can manage multiple contact forms. You can also customize the form and the mail contents flexibly with simple markup. Cleanstart design is compatible with any form created using Contact Form 7. Note that for core functionality issues (non related to design), you should refer to the plugin documentation or contact the author directly. Please, be careful. You have to install and activate Contact Form 7 before importing content! Envato plugin, provides a direct connection with your Envato account. Once the settings are saved, you will see a listing of all you Themeforest available downloads. Locate theme.zip (e.g. : CleanStart.zip) and unzip it. Make sure your unzipping software does not create extra directory with the same name nested into each other. Locate the theme main folder on your FTP program ( should be something like: "YOUR_HOSTING_ROOT/YOUR_SUBDIRECTORY/wp-content/themes/" ) and drag and drop the local version in it. FTP program will give a warning that there is already a directory with the same name. Choose "replace all". It will take from 2 to 10 minutes to replace all files. When you finish, login into your wordpress dashboard, go to Appearance > Themes, and on the "Cleanstart Parent Theme Screenshot" you will verify the new version. Child theme doesn't need to be updated unless you made no changes to it and want the new cool screenshot. Finally, a TGM notice will appear on top of your administration page to update the "Plethora Themes Framework" plugin. Update it by clicking on the notice and clicking "Update" and "Activate" under the "Plethora Themes Framework" listing in the list that appears. Or, on the "Themes" page, click to view Cleanstart Theme Details and in the popup window, click "Update Plugins" button on the bottom. Below you can find a step by step guide, taken from the Importing Content page from the WordPress website. Choose WordPress from the list, install and activate the theme. Click on "Choose File" and browse to select the .xml file of your choice from the "Demo Content" folder of your downloaded package. You will be asked to map the authors in this export file to users on the blog. For each author, you may choose to map to an existing user on the blog or to create a new user. You will then have the choice to import attachments, so click on the Download and import file attachments box and then click "Submit"
Posts, Pages, Projects, and Menus are imported. So be patient and do not refresh the page until the All done. Have fun! message appears. Go to Appearance > Menus and check "Primary Navigation" for the "Main menu" location and save. You also have to go to Appearance > Widgets and setup Sidebars and Widgets. This is a limitation of WordPress’ import system. In order to enable the Twitter Feed section on the pages, you will need to go to Theme Settings > Social & APIs > Twitter Feed Options and fill all the related fields. The Twitter Profile Link, Twitter Screen Name, Twitter Consumer Key, and Twitter Consumer Secret are the minimum required to make the Twitter Feed visible on the pages. Please be patient while WordPress imports all the content. Do not refresh the page until the All done. Have fun! message appears. Fill the title field with the name of the page ( i.e. About Us ). Right after the title field, click on Backend Editor button. On VC Backend Editor view, click on the templates icon (3rd icon on your left). On the Templates pop up window, click on 'Default Templates' tab. Now you should see a list with all default templates. Click the one you need ( i.e. 'About Us Page' ). After a couple of seconds, you will see the editor on the back filled up with content boxes. Close the 'Templates' popup window and click on the 'Publish' button on your right to save your page...and that was all! Click the Link of the page you want to copy, select the text and copy it. Add a new page in your WordPress admin. Click on the TEXT tab (not the VISUAL tab) and paste the content into the editor's field. Publish the page and you’re ready! Add another new page to use it as Posts Page. You should give a distinctive name ( e.g. Blog or News ). This page will be select as your static blog page. Important note: for the moment, you should not make any page configuration, since the options given here will change right after you set it as your static blog page on the following steps. Click the Save Changes button...you are ready! Important note: now, you have 2 ways to setup your blog options. You can go directly to the static Posts Page or you can go to Theme Settings panel > Blog ( check Blog Options section below for further instructions ). In this section you can set Body Background Color, Body Text Color and Body Link Color using a simple color picker! Have in mind that Cleanstart's design looks perfect with any light background color. You can also choose different font style for Headings and Body Text. You could select between a Standard or a Google Font family, Standard font families are usually pre-installed on users machines (PC, Mac, etc. ), while Google Fonts are loaded automatically from Google CDN. Google Fonts support different subsets, depending on the website language. Each Google Font family supports specific language subsets that are refreshed automatically on font selection. The skin color is the basic color shade for several design elements and affects the overall theme's look and feel, you can set different colors for Skin Sections Background Color, Skin Sections Text Color and Skin Sections Link Color. Usually, the skin color selection is in line with the company/organization logo. On this section, you can choose different colors for your Call to Action Shortcode. Background Color, Text Color, and Link Color can be easily set using a color picker. On this group of settings you can set your menu layout. Menu Background Color, Background Transparency and Link Color included. Footer Background color, Text color and Link color can be seted on this Settings group. If you wish to change the speed of the Text Rotator effect (found on the Call to Action shortcode) you need to set the TextRotator Animation Speed option and change its value to the number of milliseconds you want the effect to take place. On this panel you can set the header layout choosing from the dropdown list that appears, to enable or disable sticky header and hide or display side corners. Have in mind that this options can be overridden on page/post settings. We recommend you to disable Admin Toolbar during site setup! Users > Select User > Uncheck "Show Toolbar when viewing site"
Add your logo Following the steps below. Choose one of the 3 available layouts from the Logo Layout select box. In this section you can select to hide or display the top toolbar. This toolbar has a menu on the left that you can setup like all other menus and text on the right that you can fill in. Once you select to display the toolbar from the settings of a page or the general settings, all the options will appear. The head panel is one of the basic design elements on Cleanstart theme. Depending on the settings, it can be adjusted to display a different title/subtitle and background on every single page of your website. The Title can be adjusted to display the main page title or even a custom one, while the Subtitle usually is a small introductory text to the main content. The text align can be adjusted as well. As a Background, you have the option to display an image, an image slider, a local-hosted video, a Google map or just the skin color, while you may adjust the panel height in order to fit exactly on your needs. General ( settings that affect ALL pages/posts/portfolio posts ). Pages ( settings that affect ONLY normal pages ). Posts ( settings that affect ONLY single posts ). Portfolio Posts ( settings that affect ONLY single portfolio posts ). Blog Pages ( settings that affect ONLY blog pages ). Blog pages settings include detailed options for search, category, tag, date and author page. Tip: If you want to completely hide the Head Panel, you must set the Head Panel > Panel Height to 100px. Follow the steps below to create your first slider in no time! Add as many slides as you need by clicking the "new slide" button. Upload your image, type title and description. Choose "Yes" or "No" to enable or disable randomize. Pause the slideshow when interacting with control elements, highly recommended! To set this up, first you have to install "contact form 7" plugin. Then go to Administration > Contact > add new and create a new form. Copy and paste the following code to the "Form" Panel on your left. Then fill in your email and the other details and save. Now your contact form is set. Create a new page for your contact page and put the "Contact Page" Template through the Visual composer. Edit the "Contact Form 7" shortcode to load your just-made form. When you have already create your Contact Page, setting up your map as head panel background is the final step. To setup the Twitter Feed, you should first create a new Twitter Application and obtain the necessary API Credentials ( Screen name | Consumer Key | Consumer Secret | OAuth Token | OAuth Token Secret ). After obtaining these settings, fill the related fields. These settings are all you need to make the feed work. Optionally, you may set your profile link, change the number of displayed tweets and enable tweet replies. Cleanstart provides a MailChimp Form shortcode that has a direct connection with your MailChimp account. If you don't have a mailchimp account, visit mailchimp and sign up for one. Then, you have to generate your api key and find your list id. Copy and paste it to the admin required fields. Generaly we strongly recommend placing you custom CSS rules on child theme's main stylesheet ( style.css ). Nevertheless, you may place your custom CSS in this field too. These rules will be loaded on every page of the website. You may place your custom JS in this field. Scripts, set in this field, will be loaded on every page of the website. When you sign in your account you have to choose between website or mobile app. Make sure website is selected. Enter your website's url, account name, country etc. Copy this tracking code and paste it in Google analytics options section. Creating WordPress Menus is an easy procedure. Follow the steps below and you will create your first menu in no time! Have in mind that you should create pages, posts, portfolio items, etc. before adding them to the menu. Click "Screen Options" and Check "CSS Classes"
Setting up your One Page is a very fast procedure. Just follow the steps below or watch our video tutorial and you will be able to do it in no time! Go to Screen Options Panel and check discussion, then Uncheck the Discussion Settings that appear at the bottom of your page settings. Build your content using the Backend Editor. In each row there is a "Section id" field. You should put a unique id in each section in order to use it later on your "One Page" Menu. Set your "One Page Scrolling Speed" (optional). Now, you have to put each id you have already created in each menu position, don't forget to put a hashtag # before the id's. Save the Menu and you are done! Write the "no posts" title of the message you want to appear when no post where found. Write the "no posts" Description of the message you want to appear when no post where found. Cleanstart comes with a group of settings that gives you the opportunity to create a full functional WooCommerce shop without the usage of any third party plugin. Portfolio post is a custom post type created by Plethora Themes. Creating a portfolio post procedure is pretty much the same with creating a blog post with some additional options listed below. Add (one or more) project types typing the title of the project you have already created at Administration > Project Types. Create a slide show gallery with related project images. Choose to show or hide post title on content. This is the second Custom post type created by PlethoraThemes. Add sections typing the title of the section you have already created at Persons > Sections. Visual composer it's a very steady and flexible plugin configured to work together with Plethora framework. It will help you managing Plethora's shortcodes and create different layouts without coding. Please, note that we do not offer compliance with any other licensed version of Visual Composer plugin apart from the one included in Cleanstart's Package. Adding rows & columns in Cleanstart is one of the most basic and useful group of options, if you want to create your website with the demo standards. You can easily create different combinations just by setting rows and columns. Cleanstart comes with 13 shortcodes that allow you to create unique layouts using many different combinations. How to use shortcodes in the backend editor. Open a page and choose BACKEND EDITOR. Click "Add element" button (The one with the cross symbol). Choose "Plethora Shortcodes" from the horizontal menu appearing on top of the popup window. Select the shortcode you want from the list. Make your selections from the shortcode options that load and click "save". Type the title you want to appear on the button and set the url. You can set the link manually or choose one of the existing pages to link on. This is our <span class="rotate"> neweset, best, fastest</span> product! If you choose to show the display button, some additional options will appear. Select client images, set Title and (optional) URL as Caption. Enable or disable Special plan. Choose enable if you wish this plan to be your Special one! Leave it empty, if you don't need a button. Cleanstart includes three custom Plethora widgets and the native WP widgets. You can put as many widgets as you want inside of a sidebar or footer widgetized areas. Below you can read some information on how to add widgets. Sidebars ( or widgetized areas ) are part of WordPress native functionality. Please, visit Codex if you want to learn more about sidebars. Cleanstart comes with two default sidebars, the blog and the page sidebar, which includes different widgets. You can easily choose sidebar and page layout from page/post right Side Panel. Select how many additional sidebars you want. The extra sidebars will appear in your widget panel. Plethora Themes Framework provides several built-in functionality that will make things easy for advanced users and developers who want to go deeper customizing Cleanstart. You have the option to activate/deactivate any Custom Post Type, Shortcode or Widget that comes with this theme! When a feature is deactivated, the framework does not load the related code. This means that deactivating non used features will result a lighter page load! Template Parts. Get start/end and file name information for every template part file that is used in page. This will help you understand how the template system works. Layout Checkpoints. This will help you easily locate all the different elements on source view! Note: comments may contain sensitive data that should not be displayed in public. So, for security purposes, they are displayed exclusively to logged-in administrators that have access privileges to the Theme Settings panel. Cleanstart provides the capability to export all theme settings. Keep this safe, as you may keep it as a backup, or you can use it to restore your settings on any Cleanstart Installation. Cleanstart is a "Translation Ready" theme. This means it can be easily translated to any language by using the build-in Wordpress way of translating themes, using .po and .mo files. But if you need a multilingual site, Cleanstart is also "WPML Ready", fully compatible with the WPML plugin. This is a straightforward tutorial that will help you translate a Plethora WordPress theme into the language of your choice. Keep in mind that this is the suggested procedure for a localized website ( single language ). If you need a multilingual website, then you should consider moving to the next section about WPML. The only thing you need is a Gettext translations editor. On this tutorial we will use Poedit editor, which is one of the best out there. It is available for both Mac and PC, and it’s free! PO files are the files which contain the actual translations. Each language will have its own PO file, for example, for French there would be a fr.po file, for German there would be a de.po, for American English there might be an en_US.po. MO files are the compiled versions of PO files and they always have to be together. In our case, you won’t have to deal with it, as it is created automatically by Poedit. POT files are basically the template files for PO files. Open the POT file with Poedit. Go to File > Save as and save your PO language file. As stated above, it is very important that you should name this file using your two letter language code. You can find your country and language code here. For example, a French translation for France should be saved as fr_FR.po, an Egyptian Arabic translation should be saved as ar_EG.po, and an English translation for the United Kingdom should be saved as en_UK.po. Now you are ready to translate your theme. Poedit lists all translatable strings and you can click on any string to translate it. There are three default boxes below the list. One for the original source text, a second one for the translation and a third one that can include notes for translators. Every time you save your file, Poedit will automatically compile a .mo version of the file in the same directory. After finishing your translation ( it works even if you have not translated all strings ), upload those files to your /language folder using FTP. // Replace fr_FR with your language and country code. Note that after WP 4.0 you may select your default language during the installation procedure or under Settings > General in the Dashboard. Are you working on a child theme? 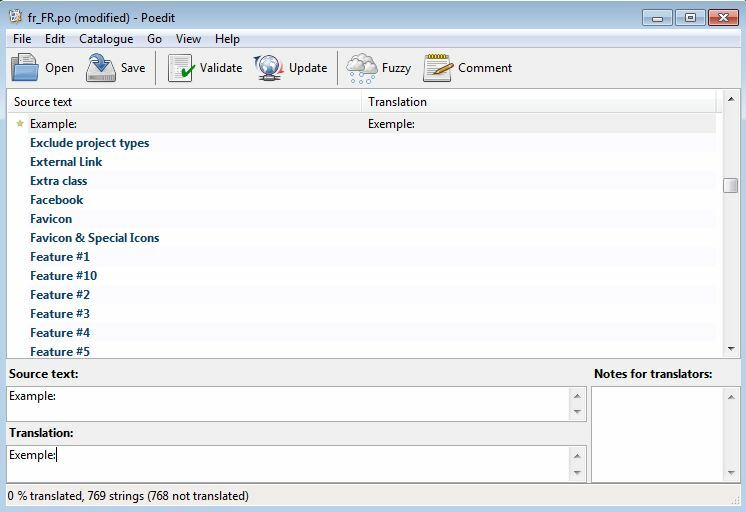 Copy /languages folder from your parent to the child theme directory. On child theme, rename the files with .po/.mo extensions according to your locale ( ie. de_DE.po / de_De.mo for German installations ). // Replace 'clenastart' with your theme's slug. Work with your PO/MO/POT files as referenced above in order to translate your website. Cleanstart is "WPML Ready", fully compatible with the WPML plugin. It comes with a wpml-config.xml that renders all custom fields, posts, taxonomies and admin fields translatable. To translate a page you need to go to Wp admin – Pages and in the list you will see columns for each active language, with a pencil icon (for ‘edit translation’) or a ‘+’ icon (for ‘add translation’) next to each page. Go ahead and edit or add the translated pages. Now you just need to translate your page into the new language. If you want to dublicate your content and then translate it, follow the instructions on Displaying Untranslated Content using Content Duplication. This will create the exact same content in different languages and keep the different copies synchronized. Cleanstart comes with extra custom post types such as portfolios, persons, sliders and custom taxonomies. In order to get a similar interface for translation/duplication as for posts and pages, you need to go to WPML->Translation Management, and select the tab ‘Multilingual Content Setup’ to see which custom post types are translatable through our wpml-config.xml file. You can add menu translations and synchronize menus across translations by going to Appearance->Menus in your Dashboard. In order for the language switcher to be displayed in the header you'll need to activate it from Theme Settings > Header --> Header Toolbar (display). From WPML > Languages > Language switcher options > Language switcher style you should choose "Mobile Friendly always". To translate strings you need to follow the procedure for Theme and Plugin Localization. Go to WPML > Theme and Plugin Localization, and click on Scan the theme for strings to see which theme strings need to be translated. Plethora Themes offers support online through its support suite but you have to register first with your Themeforest Purchase code.